This is a case study of a 29-year-old balding male who came to Dr. Shapiro’s Hair Institute and was screened for anabolic use with the S.H.A.P.I.R.O. Chart. This man used creatine, a popular workout and athletic supplement that helps grow muscle and reduce fat. His hair loss was similar to male pattern balding, with some important differences. The hair loss happened suddenly, then stopped. When he was 17, he took creatine for 6 months, and experienced hair loss six or eight months later. Then the hair loss stopped and he had no additional hair loss since. His hair loss has a very even, diffuse thinning pattern throughout his head. 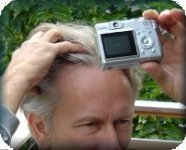 The texture of the hair is unusual in the crown and front of the head – the male pattern balding (MPB) area that is sensitive to DHT. This is the part of the scalp would be more sensitive to hormonal changes, if this subject is genetically prone to male pattern balding. The tips of the hair in this area are slightly frizzy, as if slightly singed by a candle. This hair is not quite as frizzy-looking as hair damaged by hypothyroidism. 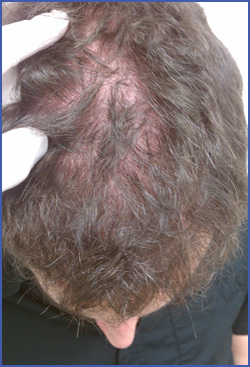 This case study is very typical of hair loss from anabolic supplements. There is an even distribution of hair loss with the same amount of scalp showing throughout the MPB areas. This is because all supplements that spike testosterone (T) or IGFBP-3 are systemic and will affect all the hair follicles by either DHT or IGFBP-3. Creatine affects DHT directly (see Pathway 4 in the anabolic chart) and also is also composed of an amino acid arginine that affects GH (Pathway 2). 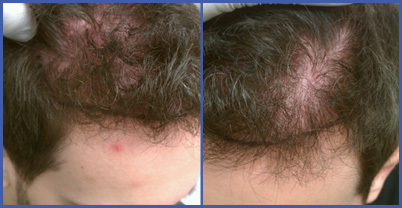 This patient is scheduled for a hair transplant at my South Florida hair transplant clinic. This entry was posted in Baldness, Hair Damage, Hair Loss, Hair Transplant on March 5, 2012 by Larry Shapiro.